Tanzanian police have vowed to act after a villager laced with poison his wife's remains to catch a killer lion. 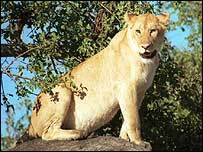 Police told the BBC they will wipe out the rogue lions that are terrorising villages in the southern Lindi area. When Selemani Ngongwechile found his wife's half-eaten body, he calmly poisoned it, knowing the lion would return for the rest of its "meal". His plan worked, killing the lion, but the police say they will use more orthodox methods. Lindi local police chief Simon Dau told the BBC that "a few" lions remained in the area and warned villagers to stay inside after dark. After killing Somoe Abdallah near her home and eating her upper body, the lion might have gone for a drink, he said. This is when Mr Ngongwechile found her remains hidden in a bush. But instead of panicking, he put the poison in her corpse and waited inside his house for the lion to return, before informing the authorities. "Nowadays there are very few animals in the area for the lions to hunt. So instead of starving they decide to kill humans rather than keep on looking for antelopes or deers which are scarce," Commander Dau said.